As a kid I went to a zoo that had a rookery. Didn’t know the word. Boring cages. Birds. Never figured it out. Now, I’m more aware of words and birds. A rookery is where there are rooks. What they call crows in England. I felt rooked—cheated—today, because birds weren’t in the wild. They were in my yard. We put out seeds, and every bird in the world came. Being a guy who believes that two-fisted bird watching is properly done away from civilization, I had mixed feelings about this. So I left home, and I walked through nearby wilds to do some real birding. But they were dead quiet. Snow, bare trees, freezing wind. No wildlife. Back in my yard there was a buck with a full rack of antlers. Coyote tracks. Fearless raccoons. Bright red Cardinals and their brownish wives, winter goldfinches. Upside down nuthatches; titmice, juncos. 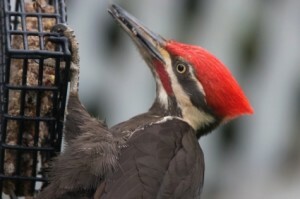 My kid claims he saw a Pileated Woodpecker on our feeder, but I have doubts about that. Hell, I want birds to be in the wild. Instead, they’re here, and only here. The wilderness is empty. This entry was posted on Saturday, February 11th, 2012 at 8:44 am	and is filed under "Daily Sightings" A Blog. You can follow any responses to this entry through the RSS 2.0 feed. You can leave a response, or trackback from your own site. Ian, You’re right about the Rook. Thanks for the information, and for your comment. Down here in Texas, we can feel the same way, but at totally different times of the year. However, I have been in that place where you can walk through the woods and not hear or see a thing. On another note, having grown up in UK, I need to correct your statement about Rook being what we English call crows. The Rook is a member of the crow family but is different than the American Crow or even the British counterpart, the Carrion Crow. I think the word “rook” derives from an Old German word that means thief. The name of the bird, a notorious thief, and the chess piece, which sits quietly until you discover that it’s blocking a move you want to make — or worse, already made — thus probably have more in common than one would first expect.